Cleaning the bathroom isn’t a job you look forward to, but it needs to be done. These bathroom cleaning hacks can help. These are bathroom cleaning hacks I’ve used to get and keep my bathroom looking great. I know they can help you too! Sometimes the bathroom can be overwhelming. You walk in and towels are on the floor. There is toothpaste on the counter, the mirror, and in the sink. And the smell don’t even start. Cleaning is needed, but you dread it. But it has to be done. If only it would stay clean. Your bathroom can stay company ready. Well at least a quick run through and be company ready when you use these bathroom cleaning hacks and a regular cleaning schedule. I’ve included cleaning hacks and how to clean the bathroom tips. Plus, you can get the free printable cleaning checklist too. Be sure to scroll down to grab a copy of the checklist. It has two sheets. One sheet with all the bathroom hacks to do a full deep cleaning of the bathroom. And also a quick 5 minute bathroom cleaning sheet for those quick cleaning tasks to do weekly. Now lets get to the bathroom cleaning tips! Cleaning the bathroom doesn’t have to be a messy, dirty job. When you clean regularly with these bathroom cleaning hacks, your bathroom can stay nice and clean. If your bathroom needs a good cleaning, these hacks will help you get it done. Then follow the 5 minutes tasks in the checklist you can download below to keep your bathroom looking great., even when you are short on time. Cleaning the bathtub or shower area is so much easier to do when you are showering. You don’t have to lean over the side of the tub to reach. Plus when you clean the shower while you bathe, you can take a longer shower or bath guilt free. ✳︎ Remove all the items from your bathtub before you clean. It’s so much easier with all the shampoo and body wash bottles out of the bathtub. ✳︎ If there is mildew or mold that needs to be removed between tile or at the base where the tub meets the tile. Spray cleaner on it. Take an old toothbrush and scrub it. Then let it sit. I leave it for 5-7 minutes while I pick up the floor and clear out any clutter. What’s the Best Bathtub Cleaner or the Best Shower Cleaner? I’ve found that the Clorox Bleach Cleaning Gel works great to get rid of mildew and mold that forms in the bathtub or shower. It’s one of only a handful of chemical cleaners I use. ✳︎ After the cleaner has had time to sit, you should notice the mildew or mold is gone or almost gone. If it’s not gone, give it another scrub then rinse. ✳︎ Now is the time to hop into the shower along with your cleaning tools. I like to use an e-cloth to clean my tub and surround. There are no chemicals and these cloths clean well. Start by wiping down the tile walls. Feel the tile to make sure they feel nice and smooth. If they feel a little rough, do a second pass. It will all depend on how much is built up on the tile or walls. If you have a shower or tub door, clean it now with the e-cloth too. If it’s a curtain, you might need to wash it in the washer. Depending on how dirty or mildewy it is. Once the walls are finished use, the cloth to wipe down the lip of the tub and then go down the sides. Finally for the bottom or floor of the tub, I’ll lay the e-cloth down and use my foot to scrub it. ✳︎ After exiting the shower, place the shampoo, soap, etc back into the bathtub area and pull the curtain shut so it can dry if you have a shower curtain. 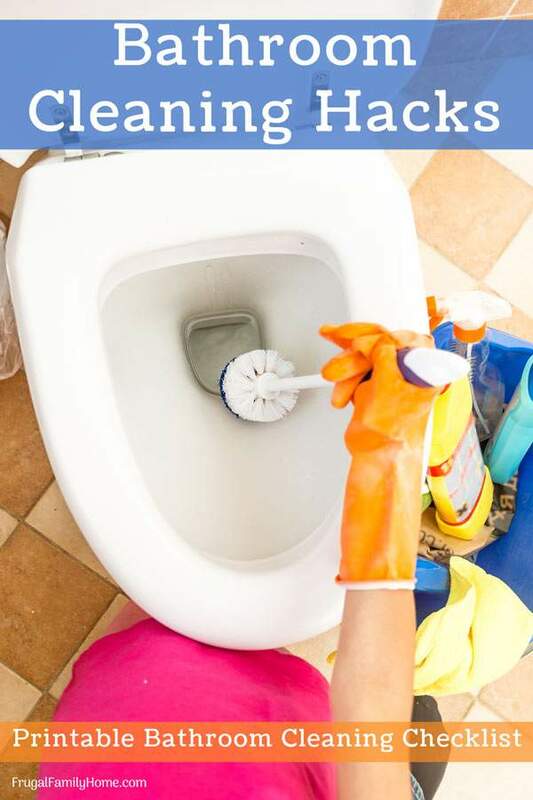 If you clean your toilet with a toilet brush each week, you’ll have no need for any chemical cleaners. But if your toilet is in need of a good cleaning the two cleaners below work great, depending on how much of a deep cleaning you need. You can use this shower cleaner recipe, it works wonders on toilets too. It cleans well for a homemade cleaner. Or if you need mildew killing power, I’d recommend the Clorox bleach cleaning gel if you don’t mind using bleach. This is a great all around cleaner that works wonders on mold and mildew. Start with the top/outside of the toilet and work down. ✳︎ Dust and wipe down the tank, behind the toilet lid and clean the handle. The handle is an area easy to forget but probably the most yucky and germy part of the toilet. I use a damp e-cloth for this job. It picks up dust, hair, and grime and kills germs as it goes. Plus again no chemicals too. ✳︎ Clean the lid, we are working from the cleanest areas to dirty. Start with the toilet lid and go around the outside. Lift he lid and clean below then do the ring lid in the same fashion. Finally wiping the top of the bowl. If you are using an e-cloth place it in the sink and grab the toilet brush. You can use the e-cloth to clean the inside of the bowl, I do it. But if you’d rather keep your hands out of the bowl use, the toilet brush to clean the bowl. Get under the rim and down in the drain area and the water line. Then place the brush with on the rim of the toilet bowl and close the ring lid on it. This will suspend the brush over the water and let it drip dry while you work on other areas of the bathroom. No more dripping toilet water out of the toilet. Yeah! ✳︎ Next step is to clean around the base of the toilet. I usually rinse the e-cloth I placed in the sink to use again. Just rinse well with hot water and ring out. Or I grab a clean one and wet it. Wipe around the outside of the toilet base, warning this could be bad if you have kids who miss the bowl. And around the base where the bolts to hold the toilet down come through. The dust builds up there. And while you are on the floor clean back behind the toilet base. It’s an area that can get missed easily. Place a few drops of essential oil on the inside of the toilet roll, on the cardboard liner. This will help the scent stay longer in the bathroom. And keep the bathroom smelling great! Cleaning the bathroom sink can be a nasty chore if you let it go. With dried on toothpaste, mildew starting around the edge of the faucet and who know what else it’s good to get it clean. ✳︎ Start by clearing any clutter on the vanity top. You might as well clean the top as you clean the sink. ✳︎ Wipe down the counter and sweep any dust into the sink. I again like my e-cloth for this task but a rag with cleaner sprayed on it works great too. 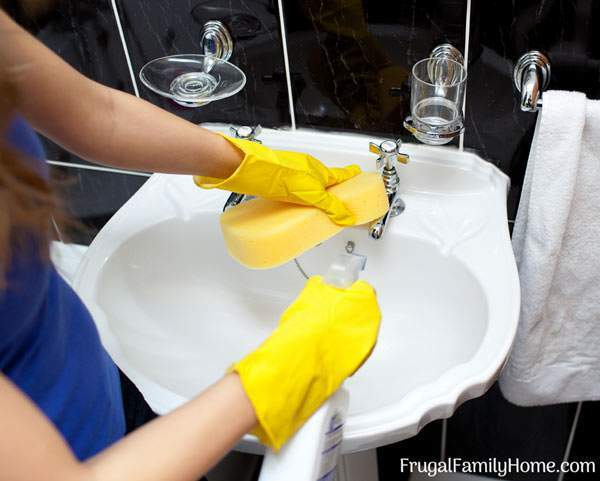 Fill the sink with hot water while you are wiping down the counter. This will help to make cleaning it easier. 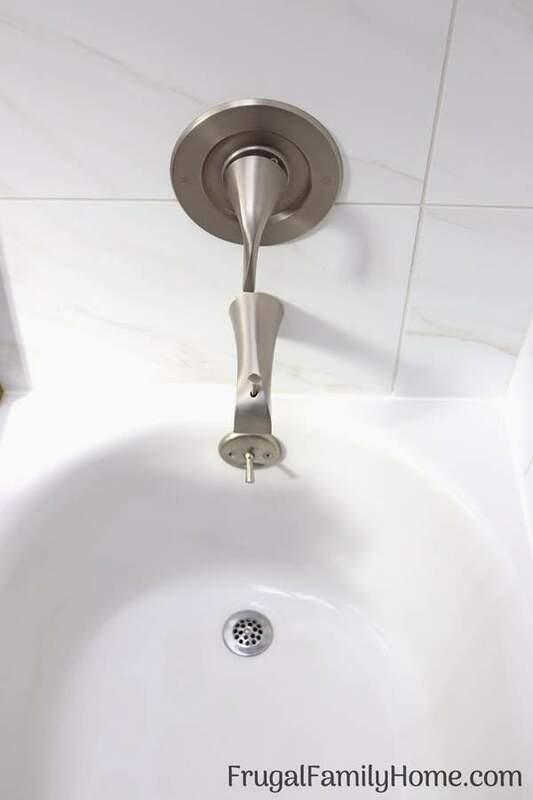 Be sure to get behind the faucet and clean around the faucet handles too. Toothpaste and other crud can build up around them. Making them less than sanitary. If you give them a good wipe down each time, you clean it won’t build up. ✳︎ Drain the sink and spray your cleaner if using the let it sit for 5 minutes to do its work. While you are waiting for the cleaner to work, wipe down the mirror and place items back on the counter. If I need the cleaning power of a chemical cleaner, I prefer, Clorox Bleach Gel Cleaner. But you might have guessed that already. If you need scrubbing power, baking soda and water can help or use a commercial product like Bon Ami. If you don’t need any chemical cleaning power e-cloths work great for this task. Scrub around the edges. If you have an under counter mounted sink, clean around where to countertop meets the sink. It’s a haven for things to get trapped. Scrub the sides and clean well around the drain. It’s amazing the muck that can build up just under the plunger. The last place that needs to be cleaned is the floor. Save the floor for the last of your cleaning so any dust or items that drop can be picked up as you do the floor. If you have bathroom rugs, now is the time to pick them up. Either vacuum them and then pick them up or if they need to be washed, throw them into the washer and start it. Along with your cleaning rags or e-cloths and any towels and washcloths that need to be washed. Once they are done in the washer throw them into the dryer. If you are wondering, can a bathroom rug go into the dryer? I’ve washed my bathroom rugs in the washer and dry them in the dryer. But if your bathroom rug has a rubber backing, check the tag to see what it says. I know some of them can take the heat and some can’t it’s better to be safe than sorry. Some of the links below are my referral links. When you use them I can make a little money at no extra cost to you. See my disclosure policy for more information. Hair can build up easily on the bathroom floor. I’ve found the best way to clean hair off the bathroom floor is to use a dusting mop. I have an e-cloth mop with a dusting head. It works great to trap hair and remove them off the floor. Don’t have a dusting mop, the next best thing is to use your vacuum floor attachment to vacuum the floor. Be sure to take the floor attachment off to get into the corners too with the wand. ✳︎ Once the floor is dusted mopped or vacuumed, take a damp mop and clean the floor. Paying close attention to the sealer in front of the tub as it can collect dust and dirt. Also around the toilet too. Be sure to get behind the toilet. ✳︎ Now that your floor is cleaned and mopped if there is any standing water on the floor, be sure to wipe it up with a towel or rug. Bathroom floors can be slick when wet and it’s not good to have wetness standing on the floor. Now that your bathroom is looking great. The best way to keep your bathroom clean is to have a regular bathroom cleaning schedule. Having tasks you do each day, other tasks you do each week, can keep your bathroom looking great. Then save other tasks for just once a month or as needed. If you’d like a checklist of daily, weekly, and monthly tasks to tackle in the bathroom. Download a copy of the bathroom cleaning checklist. To get the checklist, enter your email address in the form below and I’ll send it out to you right away. It not only contains the daily, weekly, and monthly tasks but it has a 5 minute bathroom cleaning sheet. For those times when you need to get the bathroom clean and looking great but you’re short on time. As you can tell by what I mention I use above I don’t use many cleaning supplies to clean the bathroom. I like to keep my use of chemicals at a minimum. And I find using the items below I can get my bathroom clean and looking great. Which Bathroom Cleaner Works Best? 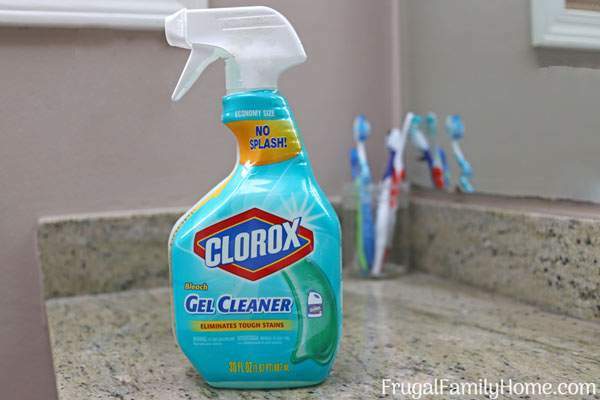 If you want to use just one bathroom cleaner, I’ve found that Clorox bleach gel cleaning works great in the bathroom. This is what I use to tackle mildew or mold forming in the bathroom. It plain works. This homemade shower cleaning works well too. It’s easy and economical to make and it plain works. I love e-cloths. I use them for general cleaning in the bathroom and beyond. They clean great with just water and can be used on all surfaces in the bathroom. If I’m good about following my cleaning schedule, this is all I need to clean the bathroom. These are my bathroom cleaning hacks and how to clean the bathroom. Keeping the bathroom clean if done regularly doesn’t have to be overwhelming. Following a regular schedule and using the right products can make a big difference. Is there a bathroom cleaning hack you have to share? I would love to hear about it. Leave me a comment below! What great tips! I’m going to have to try that Clorox gel cleaner to see if it will work on the mildew in our shower. It’s been there since we moved in, and almost nothing works on it. Hopefully that will do the trick!